Several million dollar progressive jackpots still begging to be won! Last week Deborah W. from Houston has won $20,139 playing the Loose Caboose online slot machine at GrandeVegasCasino.com. The US-friendly online casino has more than $5 million in progressive jackpots waiting to be won – and that doesn’t even count all the random jackpots available -- so it should come as no surprise that a regular player walked away with more than $20K after an evening of slots just the other night. Loose Caboose is a 25-pay line, 5-reel video slot game with a top jackpot of 5000x the line bet, paid out when five Engineer symbols appear on an active pay line. The Caboose is the Scatter symbol and three or more trigger the Cash Train Bonus Game where free spins can be won. Other symbols of trains from the Wild West include an engine, conductor and ticket. While progressive jackpots require players to spin a specific combination of symbols after placing a maximum bet, the Loose Caboose jackpot – like several others at Grande Vegas, is a “random” jackpot. This means that any player can hit the jackpot any time, regardless of how much they’ve bet or what they spin. The biggest progressive jackpots at GrandeVegasCasino.com are the biggest jackpot available to American players. Jackpot Pinatas is currently over $1.6 million. Other million dollar jackpots are the Aztec’s Millions ($1.2 million) and the Midlife Crisis/Shopping Spree ($1,055,000). Cleopatra’s Gold is worth over a quarter million. GrandeVegasCasino.com is famous for its generous bonuses and VIP comps. Players automatically earn 1 free comp point for every $10 wagered. 100 comp points are equivalent to $1 real money that can be wagered or withdrawn. In addition to their $100 Welcome Bonus, Grande Vegas Casino gives players up to another $200 in deposit bonus money every month (coupon code GRFEB11). Once a month players can also collect up to $140 with the Lifestyle Bonus (coupon code for February: ROMEO). By cashing in on special Monday, mid-month, midweek and “Wild Vegas” bonuses players can get hundreds more in free bonus cash. Grande Vegas Casino is a state-of-the-art online casino owned by Tigress Management Ltd. It offers hundreds of popular online casino games and several million dollar slot machine progressive jackpots. 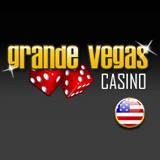 GrandeVegas.com welcomes players from around the world, including the United States.